Comprised of a woven polyester mesh panel that is held onto the rubber seal of the tailgate opening by an elastic drawcord. Initial size adjustment of the drawcord is provided by a locking device. The mesh panel, sandwiched between the elastic drawcord and the tailgate perimeter rubber seal provides fitting integrity and seals the tailgate opening from insect entry. 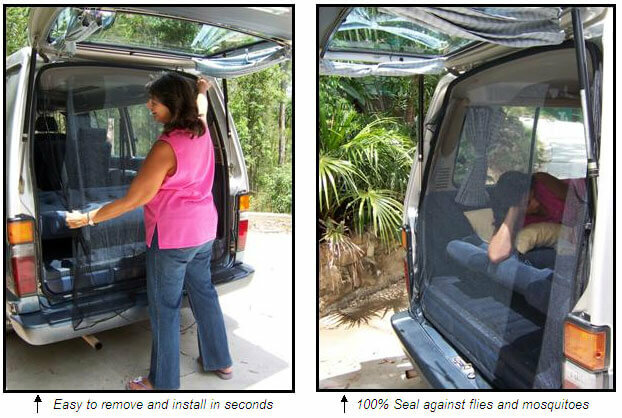 The tailgate insect screen assembly is easy to install and remove in seconds or optionally the screen can be left in situ and the tailgate door closed over the insect screen if required. When used in conjunction with our Flexible Magnetic Insect Screens installed on your motor vehicle's side windows, maximum flow through ventilation is assured. Suitable for all vans, 4WDs and hatchback vehicles that provide a perimeter rubber seal on all four sides of the tailgate opening.